If you’ve clicked on this article, then there’s quite a huge chance that you know what has happened to Terrarium TV. Unfortunately, about a month ago, the content streaming app was taken down. Terrarium TV was the wildly popular successor to Popcorn Time, another streaming service that was powered by BitTorrent and also taken down and was my go-to source for catchup TV and movie content. Unlike Popcorn Time, Terrarium TV allowed users to watch content for free- yes, for free! Of course, because of the huge savings Terrarium TV’s service provided many users with, it is safe to say that a lot of its users are having a hard time moving to subscription-based services that offer the same benefits that Terrarium TV did for free. If you’re one of those users and you’re now looking for a suitable replacement for Terrarium TV that will be easy on the wallet as well, then you’ve come to the right place. 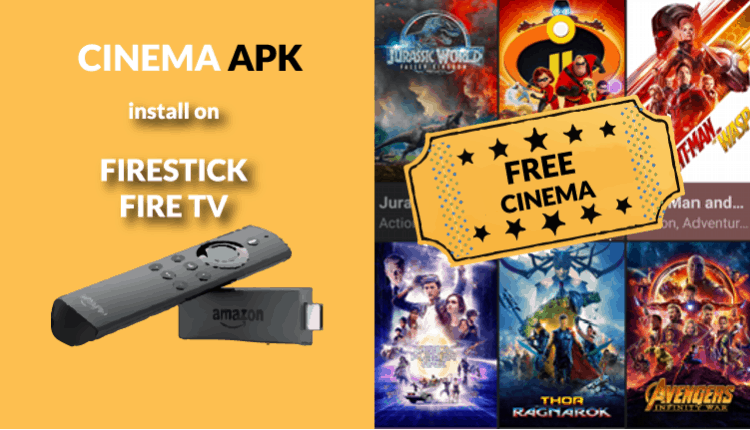 As part of How to Install Cinema APK on Firestick and Fire TV, in this article we’re going to introduce you Cinema APK; and also why it’s probably the best (and only) alternative you have for Terrarium TV. Of course, as we begin, we’re going to ask: what is Cinema APK? Is it the same as Terrarium TV? Is it for free? Can we find it easily online for installation? Well, while the short answer is yes, yes and yes! Let’s look more into Cinema APK so that you understand exactly why we’re choosing it as our Terrarium TV alternative. Cinema APK, like the defunct Terrarium TV, allows users to view movies and TV shows for free. It acts as a server for various movies and TV series. Movies and TV shows can be viewed in HD. It fetches tens of working streams for all kinds of TV shows and movies. It’s quite easy to navigate and you can look through it in terms of categories. We’re also going to provide you with details on How to Install Cinema APK on Firestick and Fire TV, but before we do, let’s talk about VPNs. For starters, VPN stands for virtual private network. VPNs act as a private tunnel or a shield that encompasses your laptop, computer or mobile streaming device that you use to access a particular website on the internet. Your device(s) are part of a private network meaning that they’re secure, whereas files on the internet are pretty public with millions of people accessing them each day. VPNs are able to hide your devices. This means that your online visibility when interacting with a link online is hidden from the rest of the world. There are various reasons why people choose to use VPNs. Some people use VPNs because they’re private, and in a world where privacy is diminishing thanks to transparency (ironically caused by the internet itself), some people want a bit of privacy. This can mean anything- privacy from other individuals, privacy from organizations and even governments. People take the viewing of their internet searches and history to be an invasion of their privacy and so choose VPNs to put an end to it. Others may use VPNs because it helps them view unfiltered content which their governments might be trying to hide from them for a set of political reasons. By using VPNs, these people are reclaiming their right to access information from around the world without government intervention. Whatever your reason may personally be, we recommend that you use a VPN while browsing the internet; it will protect you and your data from predators online. That’s why we recommend using IPVanish. IPVanish is a very secure private VPN service used by some of the leading and most popular companies in the world. It’s very secure and you can use it to protect a range of devices that you may including with different operating systems. IPVanish is available for use on Android, Apple, Windows and Linux devices. With a IPVanish account, you can protect up to 10 of your devices at the same time. But that’s not all- you can choose from thousands of IPVanish servers in more than 60 countries. This varied location of servers means that there is less load on the system; so you can expect a faster connection. Unlike some VPNs which cause your internet speed to slow down, because of the large number of servers available, this will not be the case if you use this VPN. VPNs have two primary advantages when accessing streaming content; privacy as we’ve already mentioned, but also the ability to bypass georestrictions. Georestrictions are what you experience when trying to access content that is restricted based on your location. With a VPN like IPVanish in place, you simply connect to a local server in a country where the content is available. Once connected, the server will modify your actual IP address and mask it, making it appear as if you’re in the country where the content is available! Pretty simple right? IPVanish is the best VPN for streaming online. We managed to get an exclusive 57% of IPVanish. Save 57% of IPVanish now! Go to Settings and choose Device. After pressing “Go”, the APK file should start downloading. And that’s it! Once the APK file has been loaded, you can access cinema APK on your Amazon TV! Now that you know How to Install Cinema APK on Firestick and Fire TV, let’s take a conclusion. We talked about Cinema APK, as the best alternative to replace the discontinued Terrarium TV; you can install it in Amazon TV devices – which we have mentioned here. But, before enjoying HD quality movies and TV shows online for free, you need to take care of security and privacy, along with other benefits of using a VPN . The VPN we recommend is IPVanish , as has been proved to be the best for streaming, for privacy protection and for safety as well! We hope you found this article How to Install Cinema APK on Firestick and Fire TV, helpful! I've been involved with tech and technology since the days of dial-up! I love playing with the latest toys and gadgets and am a huge fan of Android and Kodi.